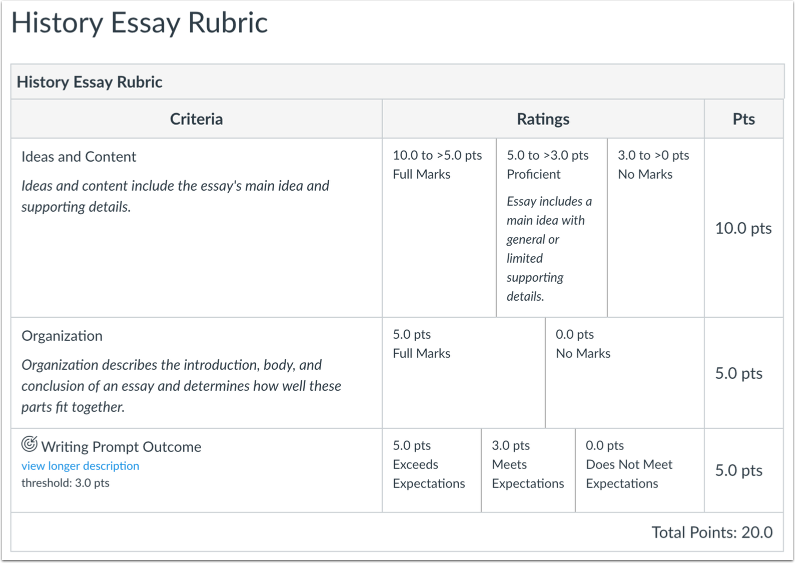 Rubrics can be set up as non-scoring rubrics, which allows for assessment-based and outcome-based grading without points. View a video about rubrics. Account-level rubrics are rubrics that are created at the account or sub-account level. They can be used by any course within that account or sub-account for assignments, discussions, or quizzes. If an account-level rubric is used in more than one place, it becomes uneditable, but is still usable. Course-level rubrics are either created at the course level or copied from the account or sub-account level. Once a rubric has been used to assess a student, the rubric cannot be edited. However, existing rubrics can be recopied and used on other assignments. Align pre-defined learning Outcomes to your course assignments and assessments. Assess online submissions in the SpeedGrader. Previous Topic:What is the Roll Call Attendance Tool? Next Topic:What is the Scheduler? Table of Contents > Canvas Features > What are Rubrics? Re: Where do I find the Canvas Rubrics "rules"?